Babe told Abe of the new acceleration rate in the growth chambers. Alarmed, he ran a complete new series of thorough biological tests but still could offer no logical explanation. Within another month, the children would advance to their predetermined age of eighteen years if the new rate remained stable! The computer silently flashed "negative" concerning the education absorption level resulting in a troubled frown across Abe's blonde brows. Abe mentally summoned Babe upon leaving the children's room. Not only did he need her comfort, he also wished her to accompany him to the shuttle to retrieve the data videotape of his return trip from the interior. He had forgotten it when he put the shuttle in its hangar bay and was anxious for both of them to share and review the new information regarding their future home. The inquisitive couple learned much from the video. After the vegetation had become sparse, large outcroppings of various mineral crystals were abundant; many with huge, geometrically formed loose crystals strewn about. The uniform, symmetrical stones would serve as excellent building materials for home wall structures. Roofs would have to be comprised of other locally available materials. Several of the scattered crystals proved to be gemstones such as rubies, emeralds, garnet, and topaz! People of old Earth would be astounded at the mass of material wealth simply cluttering their new world. Abe and Babe would put the exotic materials to good use. Houses on Hydrocryst would resemble royal, majestic castles rather than menial, mediocre homesteads! As predicted earlier, the ambient temperature had risen with decreased distance toward the interior. Saltwater flowing inward and into the sink-hole was boiled eventually by the hot core, creating steam which condensed on the cool canopy, fell as fresh-water rain and formed the river running back to Rainbow Falls. A rise in the base terrain elevation past the condensation zone prevented the backflow of the fresh water toward the core. The scanners could detect nothing further in the core's direction due to the increased curvature and relative thickness of the crystal canopy. The dissolved salt in the inflow oxidized as fuel along with all other waste products. Nature had engineered an extremely efficient system to sustain Hydrocryst's delicate and unique ecology. Great care would have to be exercised to avoid repercussions from human and animal intervention. Abe's keen instincts focused on the eagles calling from the surface, he could sense the intensity of their growing hunger. He mentally asked Babe to restock the shuttle's stores while he checked the children's room once again before their departure. Babe was telepathically aware of her mate's intention to reclaim the New Hope's previous orbit around Hydrocryst prior to the surface rendezvous to feed his loyal friends. Inside the growth room, Abe marveled at the dramatic progress exhibited in the chambers of life. The occupants could no longer be justifiably called "children'' at this point. They had physically progressed to a state of human maturity, and each was a profound example of genetic perfection and beauty! The overall resemblance of the mated pairs was astonishing. Like Babe and himself, they were genetic carbon copies of each other; the only physical differences stemming from the innate qualities governing masculinity and femininity. Abe wondered how their individual levels of intellect would vary from Babe's and his if the education cycle had been absorbed. Unfortunately, they may never know, . . The original program had intended for the entire group to receive the same "basic" education (not nearly as extensive as Abe and Babe's but enough to be deemed "incomprehensible" to normal mankind), except that each pair was to be specifically schooled in a different intellectual field intended to benefit all of mankind. Abe vowed to carry out the primary objective regardless of the initial outcome. Babe interjected into his thoughts that she respected his integrity and would teach as well if necessary. 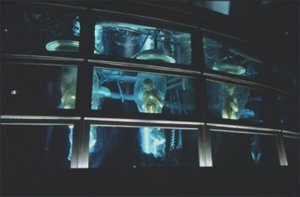 With the current acceleration rate in mind, Abe reprogrammed the computer to calculate the exact date which he and Babe should shut down the growth chambers and bring their peers to full living consciousness. His mind was vibrantly alive with the final anxiety of vast possibilities which might unfold after completion of the last sequence. Without the usual remorse, Abe purged his mind and focused his thoughts on the present task of returning the New Hope to her stable orbit above Hydrocryst. Abe knew Babe was patiently waiting for his expertise in the main control room. While restocking the shuttle, her acumen advised her to add extra rations for the eagles in case Abe decided to let them stay at the camp. She instinctively realized he would never cage them again or hamper their sublime heritage of freedom in any way. She felt the same intensity about the doves cooing softly on her shoulders. Smiling within, she programmed the preliminary blast-off code into the master computer. After Babe's unnerving ordeal and the worry which befell her during the drastic separation from her beloved mate, she had finally named her precious, little feathered friends. The male would be called "Olive", for the hope and evidence of new life which the dove delivered to Noah during the great flood in the biblical era of Earth. The female she called "Love", which in her reckoning, constituted the supreme basis for all worthwhile life. When Abe briskly strolled in, he audibly said, "Hello Babe, Olive, and Love!" Babe grinned in her uniquely provocative way, fondly aware that Abe was pleased with her fitting choice of names. She also sensed he was pondering on names for his eagles as well, but their increasing hunger dominated his thoughts at present. Abe wasted no time in completing the final blast-off sequence. The coordinates remained precisely the same as the original orbit. Blasting off, the artificial gravity of the New Hope increased with acceleration combined with the Dead Planet's pull. Scarcely an hour passed before the stable orbit above Hydrocryst locked into the navigation system. Abe, Babe, Olive and Love all proceeded to the shuttle. The bright, full sunshine felt joyously warm on their skin through the cockpit windows, and a comforting calmness settled their spirits. Birds and humans alike felt as though they had truly formed a family within the vast wilderness of deep space. Abe had loaded another fusion generator to replace the extra one he had installed in the shuttle. In the future, they might need the extra speed and power again, so he decided to leave the installation as it stood. He mentally warned Babe of the potential overload hazard. Abe intended to send the craft on an unmanned exploratory mission to collect data on the more remote regions of the mysterious interior. Babe had added a portable electric stove to the supplies destined for the base camp. She would cook dinner while the shuttle was gone soon after Abe fired the new generator. The short trip to Rainbow Falls was without incident. The group arrived at the camp soon after passing through the massive falls, but the eagles were nowhere to be found. Abe displayed no concern for their safety as he busied himself with restoring the power system. They were fully capable of fending for themselves except for the food factor. Babe carefully arranged the new supplies inside the dome tent while Olive and Love happily honed their formidable flight skills in the narrow band of open air.